A CPA by day and a fledgling artist by night. My heart belongs to anything creative, that is in writing and drawing (and gaming *ehem*), but I’m not regretful for pursuing the accountancy profession (mainly because it pays my bills. lol) Someday I wish to be able to actually do what I want and make a living out of it. Back then I would answer stuff like, “for my family,” “for my mom,” “for God.” Answering that question felt so easy, and yet until now I still find it very difficult to get up in the morning. I wonder if it has something to do with me being a heavy sleeper, but then this is still the case even when I complete my 8 hours of sleep. Seriously though, what motivates me? Nothing seems to excite me enough to get up and start a new day. Everyday is just a routinary set of mundane tasks–work 12-14 hours a day for 5.5 days a week, and then catch up with friends and relax on the remaining 1.5 days. Those 5.5 days of work extremely dries up my energy, and I now feel like I’m living to work, rather than working to live. No matter where I go, this is the feeling I get. Is something wrong with me, or is this career just not for me? I mean, for my current job, the pay is quite nice and it’s near our house, so what else can I ask for..right..? Well.. I would greatly appreciate even just a tiny bit more free time. There are a few options available for me: transfer to the bpo industry (most of which is situated in the heart of the metro and would take me at least 2 hours travel time to get there–but the pay is good and the work hours are more forgiving), work abroad (quite risky but I’m feeling adventurous so why not? 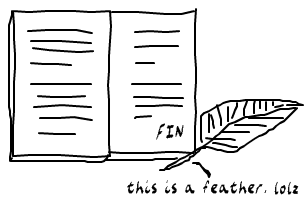 ), or consider a career change (would definitely love a career as a writer or a graphic artist lol). Or maybe, just maybe, stay put in my current job and end my long streak of job hopping? Whenever one is at a crossroads like this, people say, “God has a purpose why He placed you there.” I hope it gets revealed to me soon. The following are some tell-tale signs that you are having a QLC. 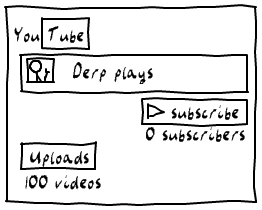 These are based on my personal experience. All your college days, you were revved up to the idea of working and earning money as a reward for your hard work studying. What’s sad is when you do finish five years of studying and about half a year of preparing for a licensure exam, and you realize that it isn’t the kind of work that you would want to do (all the more for lawyers and doctors, God forbid). Even sadder is the idea of practicing your profession your entire life but not liking it one bit. You’re tired, depressed, and negative. Why am I always so low on energy and can’t survive the day without caffeine? When will I ever get my “me time”? Why am I stuck in this awful job? When will I be able to save enough money so I can quit my day job and finally bless the world with my sheer artistic talent? (Heheh.) Since when did keeping friends and making new ones become so hard? You binge-watch Youtube videos, you binge-read Buzzfeed articles, you binge-browse at Facebook, you binge-everything. You’d go on vacations once in a while and yet they all feel so rushed and short-lived. No matter what you do, you feel like you’re stuck in a rut. You’re wishing to do something crazy but too afraid to get out of your comfort zone. Your comfort zone is the number of things you can do without feeling anxious. Hence, this can be especially hard if you’re a person with anxiety issues. Your parents keep on asking when you plan on getting married. Your friends nudge you to be more proactive in the dating game and set you up with random strangers just because. You can’t break up with your current beau even though you are unhappy, because you’re too scared to start over. Comparing yourself to people your age. OCD (Obsessive Comparison Disorder) is term coined by allgroanup.com. This is a common condition among today’s youth; but honestly, they are also the ones to blame for falling prey to such obvious media traps. Time seems to flow so fast and out of your control. I feels just like yesterday when I graduated from college. Long gone are the days when studies are my priorities. The days now change very fast as I concern myself with deadlines and countless overtime sessions at work. It feels like my employer owns me. Now I’m too scared to sleep tonight and wake up tomorrow as my 30 year-old self. Yikes. 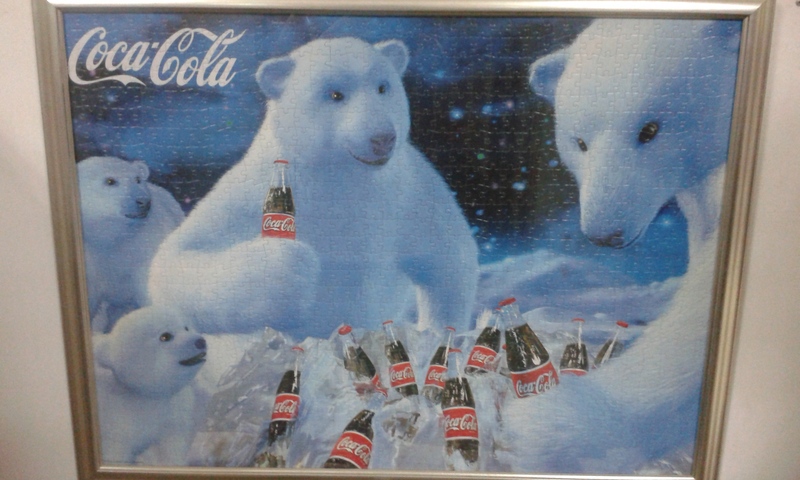 Cure your OCD at its first sign before it gets worse. Someone told me that quitting Facebook is a social suicide. You know what? He’s right. But I’m a lot happier without it. Always remind yourself that life isn’t a race. The only persons that you should compare yourself to are your old self and your future (ideal) self. If possible, find a mentor, or a role model. Personally, I find Sophia Amoruso’s story extremely inspiring (#Girlboss). Get out of that bubble. The world is your friggin oyster so don’t you ever think that you got no other options. Don’t make excuses. Act on it. Great ideas are useless if not paired with action. Stop stressing over the things that you have no control over. Be grateful about the good things and don’t mind the bad. Besides, worrying won’t solve anything. Smell them so forcefully that the pollens get inside your nostrils. Always sieze the day. Make a solid schedule and develop habits. Make sure to stick with them. Stop being such a people pleaser. You don’t need other people’s constant reassurance. Learn what you really, truly love. 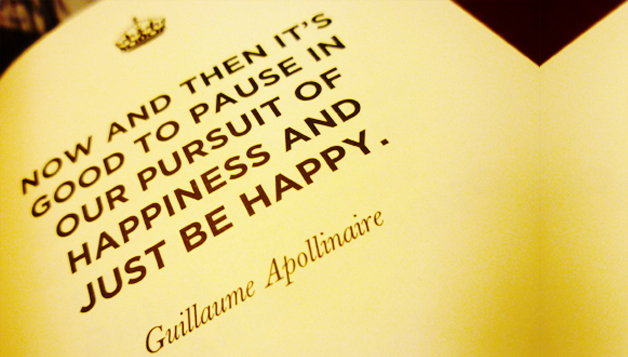 And then, pursue it will flaming passion. If you’re gonna fail, fail NOW, rather than in your 30’s or 40’s. Don’t be scared to try something new. Never fall into the trap of thinking “Well, I’m already on this path so even though I’m unhappy, I’ll just continue going through it.” Do yourself a favor and stop compromising your happiness. You can do better. Above all, just always remember that you are not alone in this. Take this opportunity to finally figure out who you are and what you should be aiming for. But then again you don’t need to have it all figured out–just enjoy the ride. As you might have noticed, I got a new domain name and changed the previous “avantgardewallflower.com” to “mejustbeing.me” (Hopefully not trying too hard to sound witty. Haha). For starters, avant-garde sounds a bit too ambitious, arrogant even. Last year I really was just racking my brain for anything. 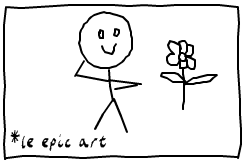 I was like, “Well, I want my blog to showcase all my artistic prowess. Avant-garde would be a nice touch.” Aaaaand you know what happened. I kinda wasted my one year’s worth of domain purchase and published a pitiful number of posts. 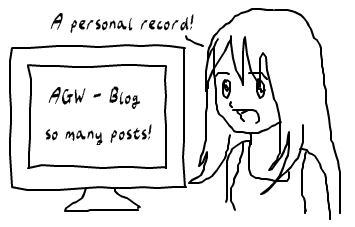 This time, I just want my blog to feel personal. Something I will be comfortable to go back to every now and then, to share and write even my most trivial random thoughts. 1) Written at least three posts a week in this blog (a total of 156 posts or more) – Nah. I was able to do six posts over the course of one year. Yes. S-I-X. Averaging one post every two months. And I’m not very proud of it. Meh. 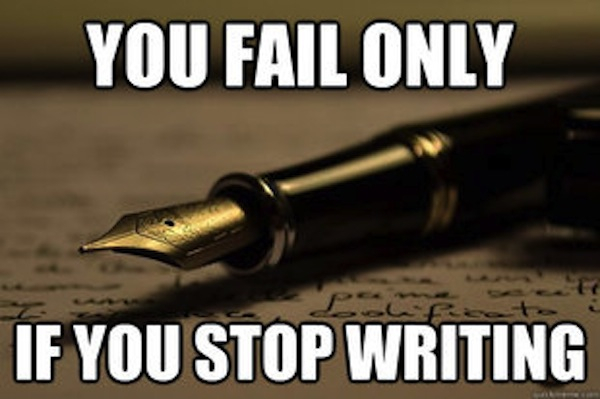 3) Finished writing at least one fantasy novel – Nah. My excuse? I chose Let’s Play over NaNoWriMo. Seriously though, how could I not do both? I can at least share this one. 5) Made my first otome game with Eu – Nah. We realized it’s a lot harder to create a game. We’ll surely do it someday though. 6) Visited Japan – Nah. Unfortunately, the VISA requirement is still up, contrary to the rumors that it will be lifted. I learned that visiting Japan isn’t as easy as it sounds (especially if you don’t have the moolah). Got some goodies from Japan though, from friends who visited there. I will create a separate post about that. This is the logo I made for the group’s travel agency. Bag of Beans — high-end cafe which offers coffee and cakes. 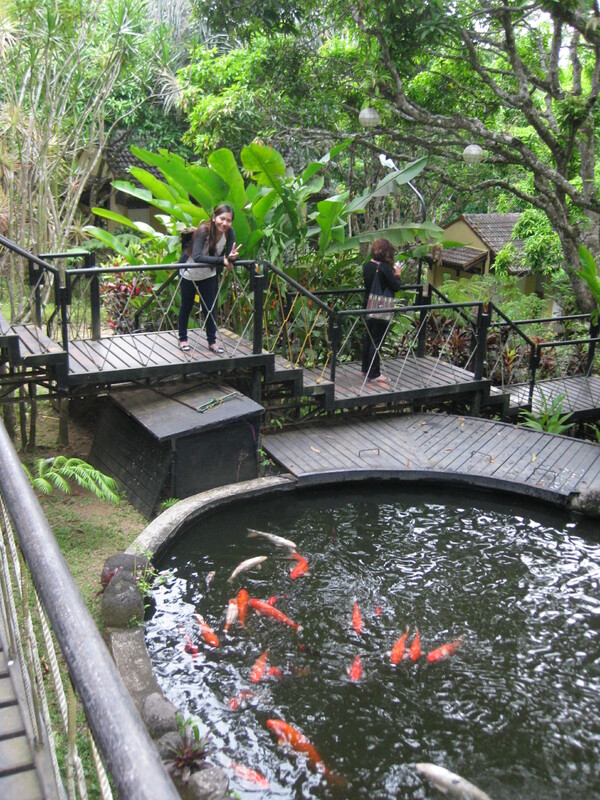 There are two branches in Tagaytay, and tourists often eat breakfast here. Mahogany Market — a bustling market where they sell various foodstuff. The second floor houses eateries that offer bulalo, with unlimited kapeng barako and bananas. Sky Ranch — a theme park famous for their Sky Eye (highest Ferris Wheel in the Philippines) and Super Viking (similar to Anchors Away in Enchanted Kingdom). They also offer horseback riding. Ilog Maria Bee Farm — souvenir shop that offers all-organic products. You may visit their bee farm as well. 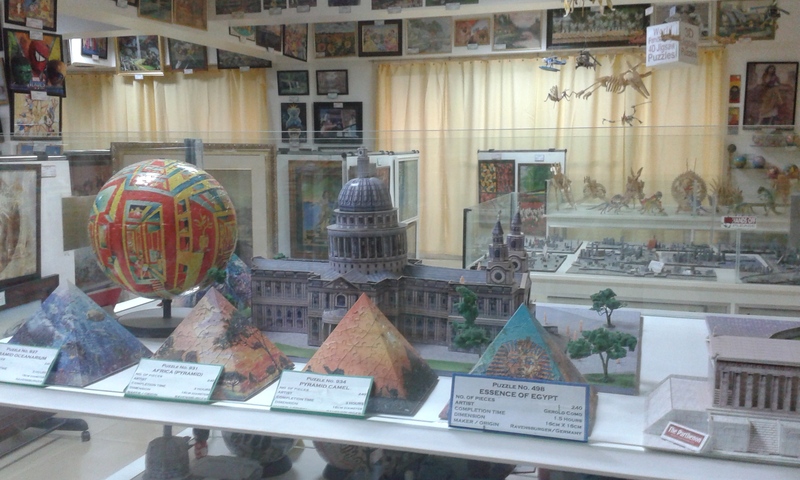 Puzzle House Mansion — a puzzle museum that holds the Guinness record for the most puzzle collection. Its cafeteria also offers the famous coconut cream pie. 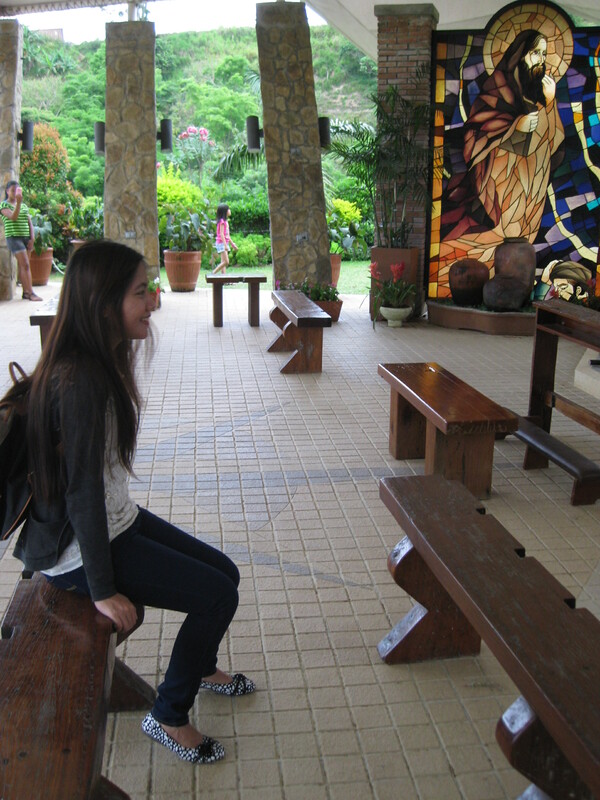 Caleruega Retreat Grounds — a solemn place perfect for a spiritual retreat, full of architectural wonders overlooking the mountains of Nasugbu. Sonya’s Garden — a heavenly garden with flowers and trees and vines everywhere. Only people who availed their room accommodation are allowed to come in, but people who intend to buy products in their Panaderia are welcome (their specialty are the Hispanis bread and the cheese hopia). 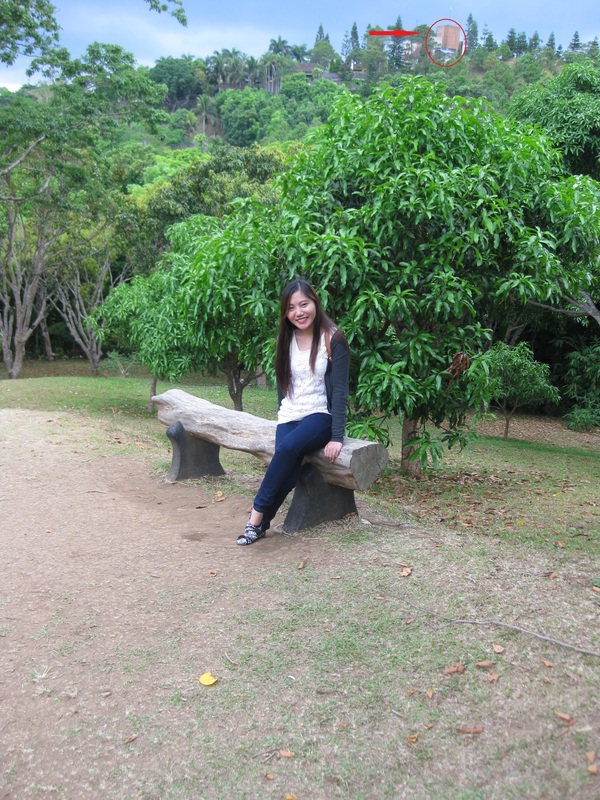 Picnic Grove — a park where you can do activities like zipline and fly kites. 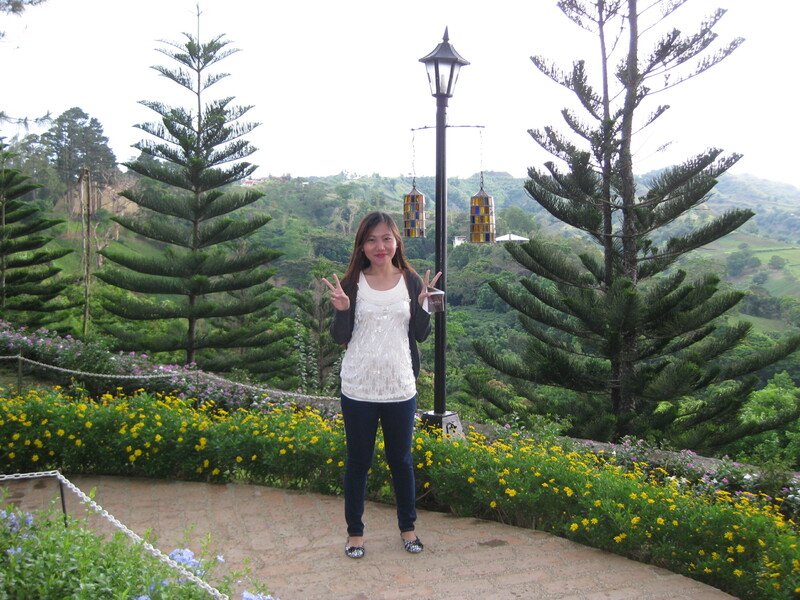 People’s Park/Palace in the Sky — a historical park overlooking the Taal Lake. A lot of reviews say that it is not very well-maintained. Paradizoo — a colorful theme farm that showcases a huge variety of flora and fauna. Pink Sisters — a convent of nuns clad in pink. They’re known for holding short Catholic masses, 45 minutes max. 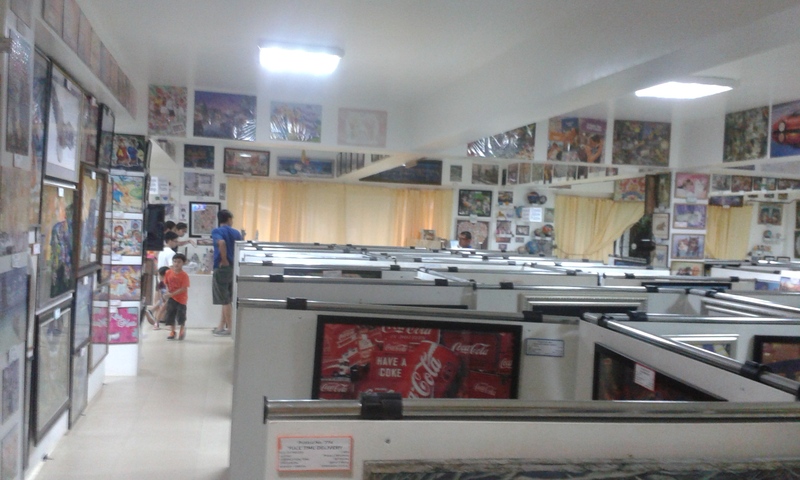 When we arrived at the Coastal Mall, there were no buses yet to Tagaytay or Nasugbu, and so we first bought donuts and orange juice at a Dunkin Donuts stand nearby so we could have something to eat during the trip. After around 30 minutes, we were able to ride the bus with the “Tagaytay” signboard, and after another 15 minutes of waiting for passengers, the bus started moving. After a long ride, we were dropped off at Olivares Plaza. From there, we rode a Jeepney with the sign that says “NBI,” and after about 10 minutes, we arrived at Mahogany Market. On the way there, we passed by the Sky Ranch and the first Bag of Beans cafe. When we got to the second floor of the open building, we were greeted by vendors who wanted to promote each of their stores. “Ate kuya dito na kayooo!” They were pretty pushy and aggressive, which was irritating, so we just immediately picked one place where they offer the free unlimited bananas. Everyone was fixated on the ongoing Pacquiao-Mayweather fight, and we went to an eatery without a television in it, so we could have the place to ourselves. 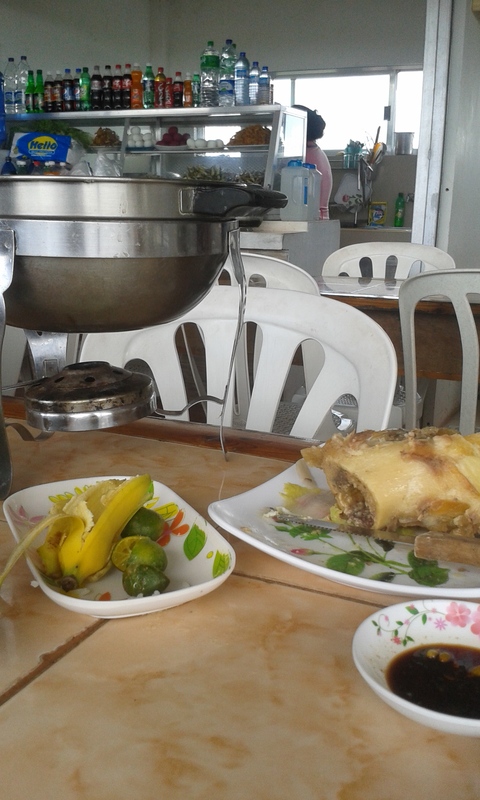 The bulalo was served on a heater, and we helped ourselves to this dish good for 3-4 persons. Yuya ordered a canned pineapple juice for P50 (twice the original price in a grocery store. meh) since the bulalo is of course a bit fatty and unhealthy. The aftermath. 😛 By the time we finished eating, it was announced that Pacquiao lost to Mayweather. Oh well. After eating, we went around the market to see what they’re selling. They were selling pastillas, chicharon, and various other delicacies, as well as souvenir items such as caps, shirts, wallets, and keychains that say “Tagaytay.” Also in front of the market is a gardening store that sells little plants. In there we waited for a bus to Nasugbu. We were dropped off to an area with several tricycles parked on the side of the road. 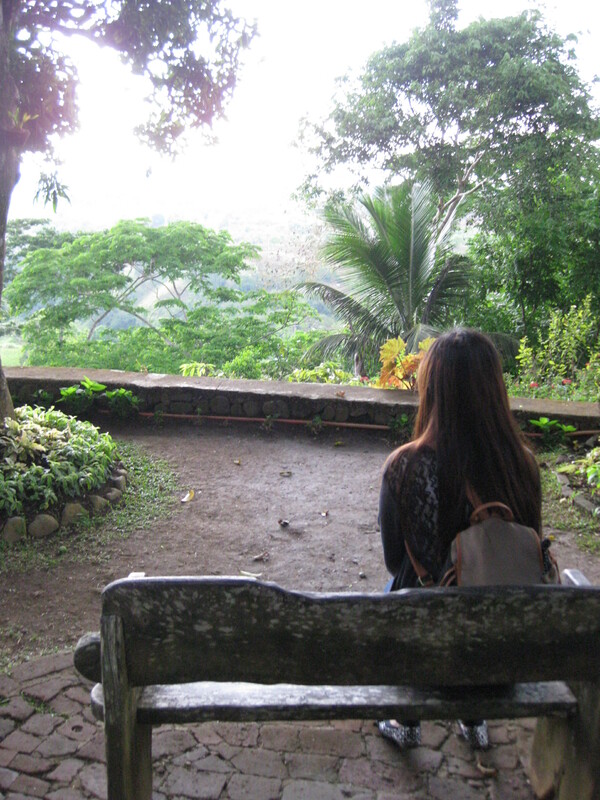 I recognized the place as it was the same place where we started our Batulao climb last year. There was this lone backpacker girl who asked if we could ride a trike together, but the driver said it was not allowed (policy daw. hmph). We talked to a tricycle driver and he asked us to save his number so he could pick us up later. The ride there cost us P25. 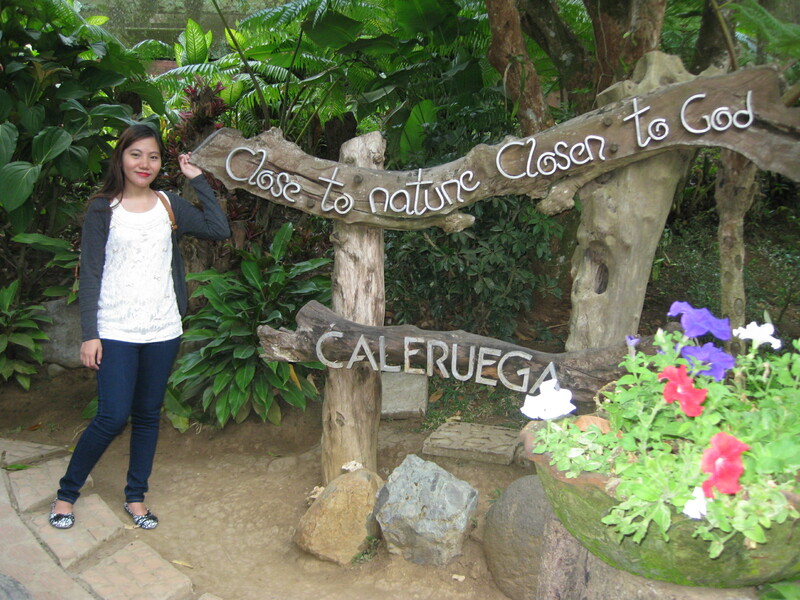 We arrived at Caleruega a good 5 minutes later, and paid an entrance fee of P30. It was really worth the money, considering how much fun we had (and how much calories we burned as we explored the place. heehee). Breathtaking scenery up here. Haaaaay. Overlooking Mount Batulao. Heck, I was traumatized in our climb there last year! The Koi pond. This area is a bit hidden, so make sure to look for it. 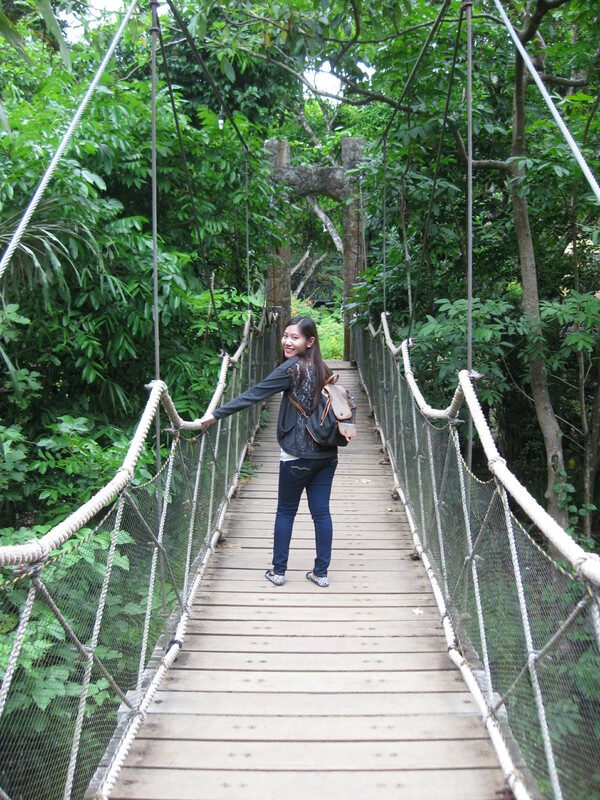 This route leads to the hanging bridge, and finally to the tent chapel. Check the map they give you at the entrance if you can’t find it. The bridge is a bit wobbly, making it enjoyable to cross! Haha. The route to the tent chapel was really tiring! On the way there, there are two bahay kubos that sell fresh buko juice for P25. 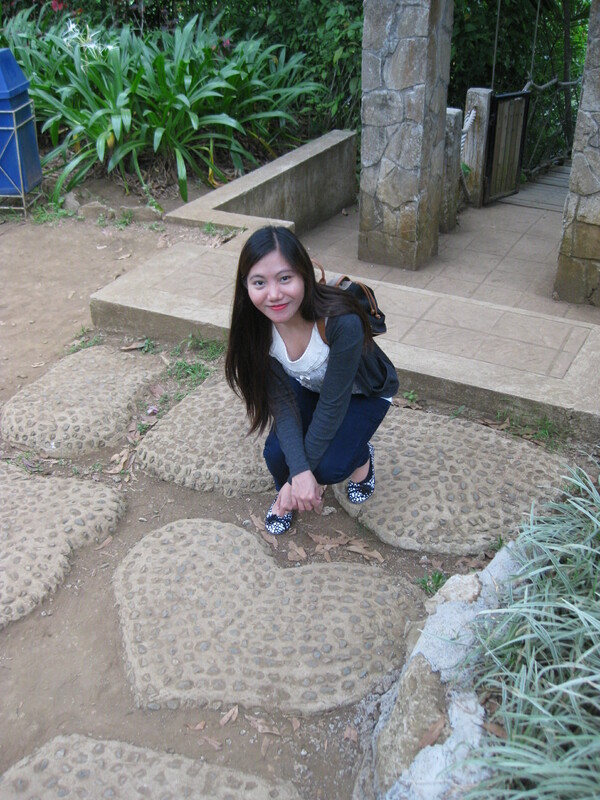 This place is used for prenup shoots. In fact, there was a wedding going on when we came here. The chapel is the final stop. Take time to catch your breath here and pray a bit. There is also a restroom nearby if you need to use it. The tent chapel at the top of the hill. It sure was worth the climb! By the time we finished exploring, it was already 3:00 PM. We texted manong to pick us up, but he still wasn’t there 15 minutes later. I tried calling him, but he said, “Wait lang po.” Another 15 minutes later, the tricycle came with a different set of passengers. 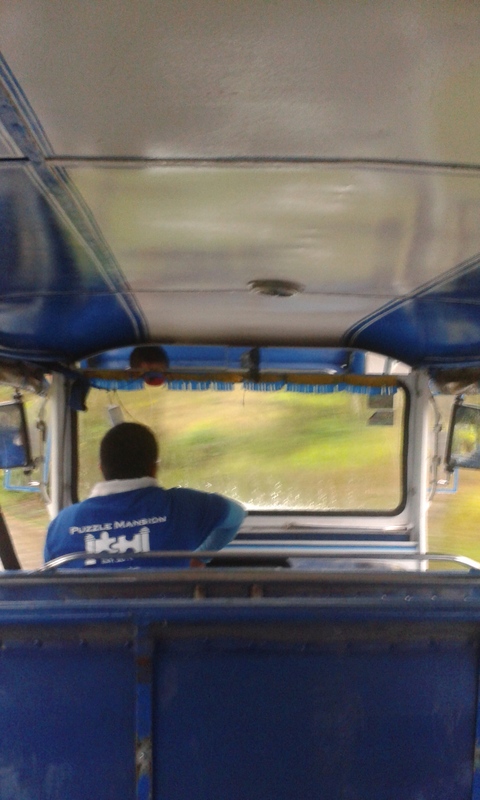 He kept us waiting to be be picked up because he was waiting for passengers who are going to Caleruega. Sheesh. It was a bit infuriating as we wasted 30 minutes and we should’ve gotten a different tricycle. What’s more, it was already raining when he came; if he picked us up sooner, we’d be in the bus already. Ah well, bad customer service. It took us another 30 minutes to get on a bus (“Pasay” signboard). Since it was already quite late and it was already raining heavily, we decided to scrap the plan to go to Sonya’s and just leave it for the next trip. For P25, we asked to be dropped off at Brgy. Asisan (people won’t know if you say Puzzle House Mansion). Alternatively, you can ride a jeepney.From the drop off point, ride a tricycle (For P25). And from there, a shuttle will pick you up (pay P20 for the trip back and forth). 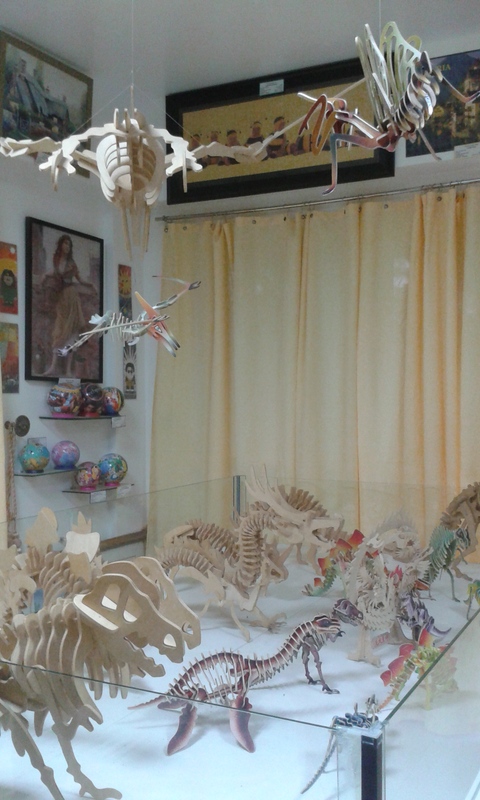 The museum is on the ground floor, showcasing 1000+ jigsaw puzzles, each one saying the puzzle number, the title of the picture, the artist (if any), the completion time, and the number of puzzle pieces. 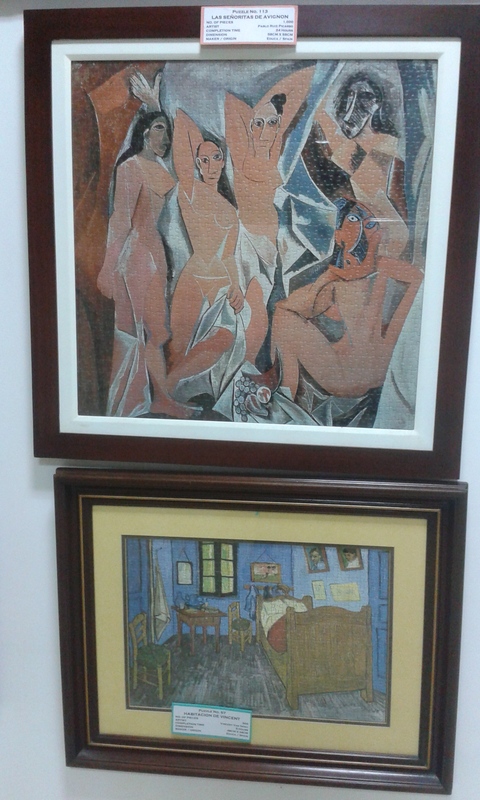 There are a lot of classical paintings made into puzzles like these ones by Pablo Picasso and Vincent Van Gogh. 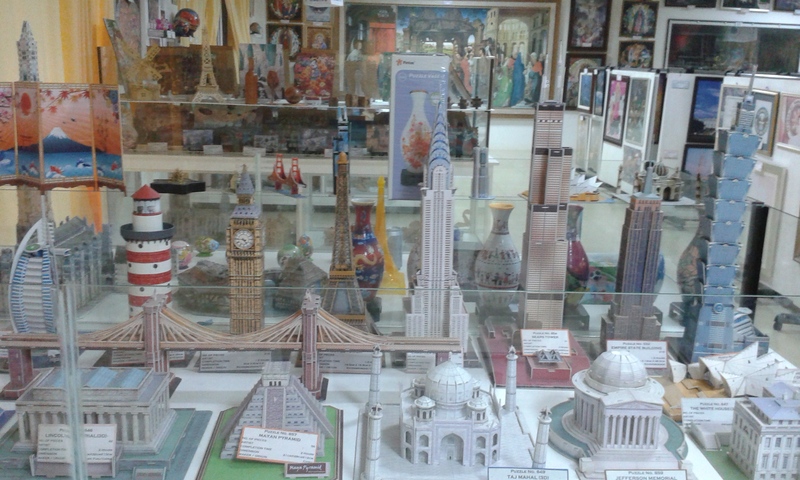 A whole bunch of 4D puzzles of architectural landmarks around the world. What I was really looking forward to was the coconut cream pie! Drew Arellano was raving about it in his travel show Byahe ni Drew. I sure wasn’t disappointed! It melts in the mouth and the filling has a texture like that of macapuno. The coconut cream pie is the ultimate buko pie–so creamy and tasty with just the right sweetness. Yum! 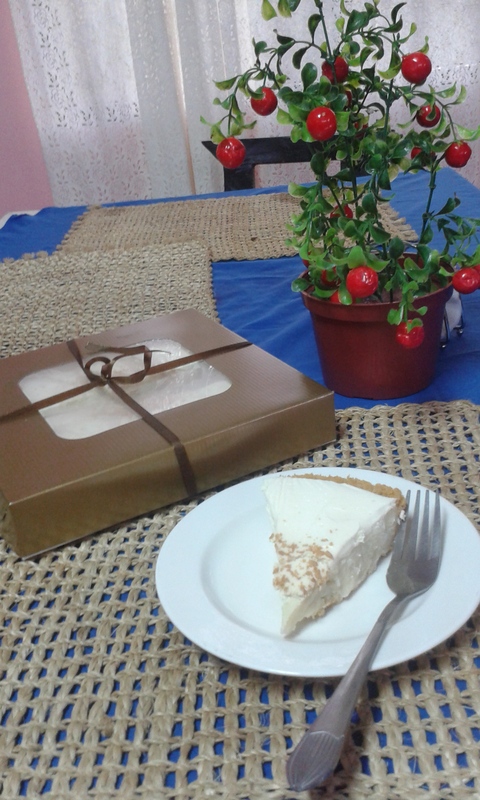 We both bought a box of these tasty pastries for P370 and tried a slice while we were in the canteen. We then rode a bus with the “Pasay” signboard and headed home. 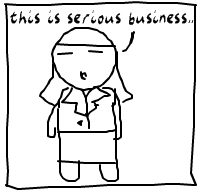 Starting January until just lately, it was “busy season” at work (I work for an international auditing firm). I worked for 10-14 hours on a daily basis and it was extremely tiring for my poor introverted self. I needed a fast, guilt-free stress-reliever. 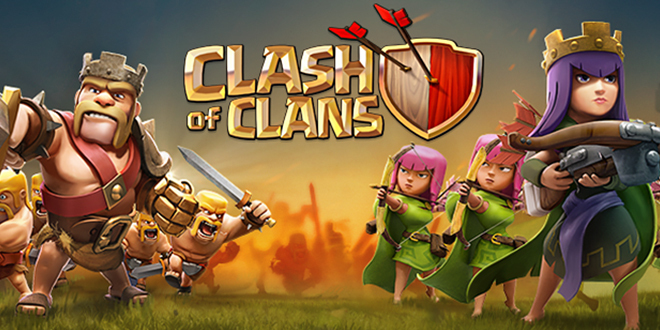 Now unless you live under a rock, you would know what Clash of Clans is. It’s a free mobile strategy game for Android. The community for this game is quite big in the Philippines. When I ride on jeepneys, 50% of the time, I’d catch someone open up his phone and check his CoC account. I personally didn’t like it at first–joining in the bandwagon just because it’s popular at the moment–but something changed when I heard my older sister and brother talk about it. Yuya recommended it as well. So out of curiosity, I downloaded the app and tried it. I took it as a challenge to catch up to my brother and Yuya who started playing way long before I did. 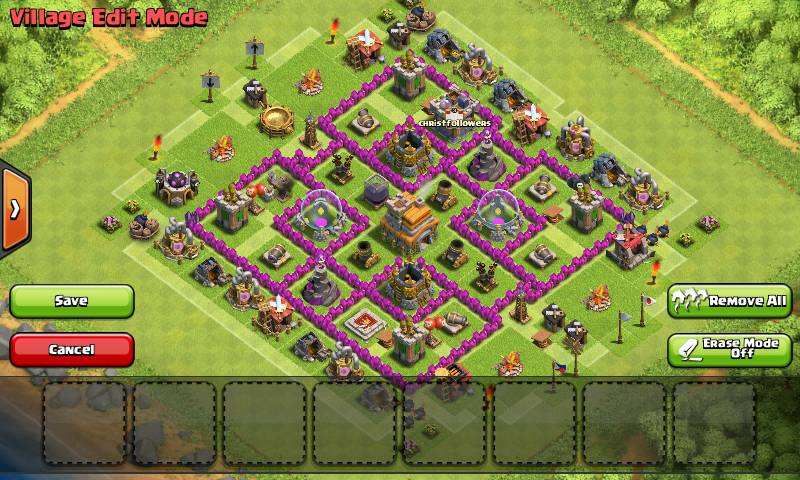 It’s a good farming base for Townhall 7; makes it difficult for raiders to steal my hard-earned dark elixir. This one’s my war base. 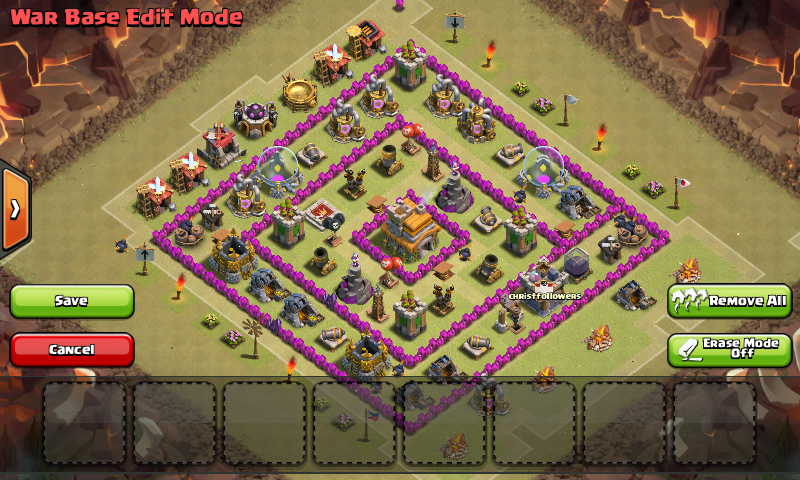 The goal is to keep the enemy from scoring 3 stars when they attack me during clan wars. Personally, I think what makes the game so addicting is the community. In a clan where teamwork is the key to growth, it can be quite embarassing not to participate during clan wars, most especially if you’re one of the leaders. It’s also worth noting that if you are extremely competitive, it is hard to abandon the village you worked so hard to build. I know this personally and having Yuya on the same clan makes it difficult for me to drop my A-game. When two people die at the same time, they are judged as to who will be reincarnated and who will be banished to the void (the equivalent of hell). The souls are taken to a place called Quindecim (a mysterious bar run by bartenders called arbiters) without any memory of their death, and they are prompted to play a game “with their lives on the line.” These games are pre-determined based on the guests’ personalities, ranging from air hockey, to videogames, to bowling, and so on. Of course the dead cannot die again; the game is deceitfully designed to put pressure on the players to reveal the darkness in their hearts. In short, the judgment is not based on who wins or loses the game. The players’ desperate actions during the life-and-death game, as well as how they generally lived their lives–these are what the arbiters use to judge the souls. 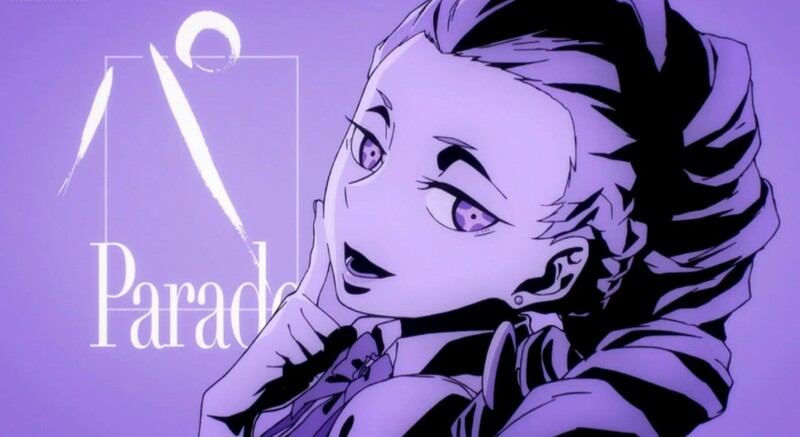 For an anime with only 12 episodes, Death Parade surprisingly has a great range of memorable characters. From the regular guy who suspected his fiance of cheating, leading to their deaths; to a hopeless mom who feels like she is a failure as a parent because her child committed suicide–it’s difficult for the viewers not to find themselves empathizing with the characters. 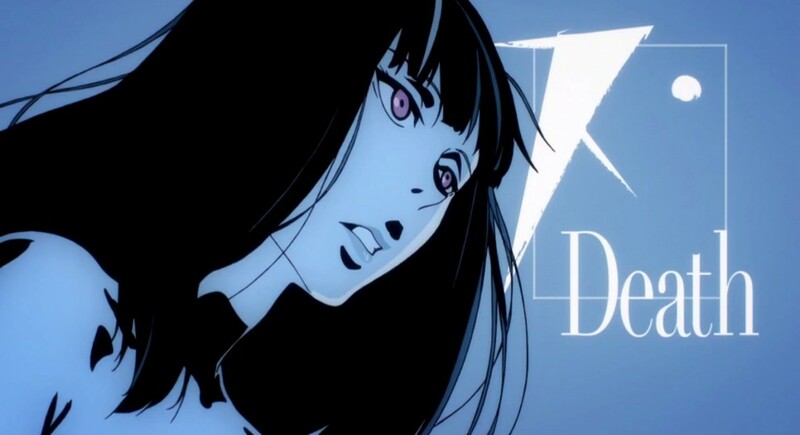 The musical score for the whole series helped give off the psychological thriller vibe and gave justice to the pure beauty of the series’ premise. I incredibly liked the opening song Flyers by Bradio–I can listen to it over and over again! The upbeat OP is a stark contrast to the series’ dark theme, which isn’t a bad thing. The ending theme on the other hand, Last Theater by Noisy Cell, fits the mood. 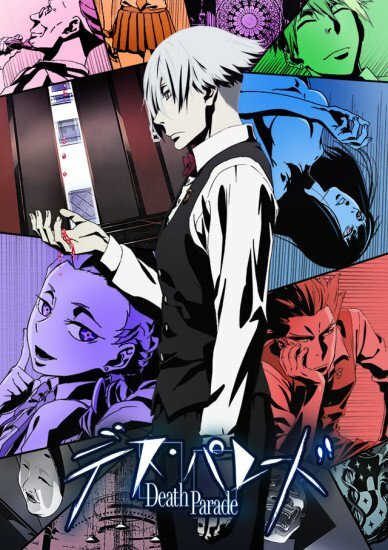 Death Parade is the kind of anime that I’ve been looking for all these time. “What is the meaning of life?” “What happens after death?” “How will we be judged when we die?” These are deep topics I’ve been struggling to decipher, and the writer of Death Parade tried answering these questions in his own way. In Death Billiards, the game is between an old man and a middle-aged guy in his 30s. In their flashbacks, the old man was a part of a gang in his younger years, and was always up to no good. However, when he got married to a kind woman, he was able to change his ways and started leading a peaceful life. The younger man on the other hand, was still in that phase where he would do anything to succeed. It definitely gives the audience a moment to decide as to whether the judgement process is moral and fair; is it enough to simply judge a person based on how he acts during desperate times? Surely, a single method cannot be absolute; a lot of things need to be taken into consideration. 9.5 out of 10 dolls. This anime is pure genius. The only thing I didn’t like is the vagueness of the endings, especially that of Death Billiards. The series tries its best to be deep and thought-provoking, but almost to the point of irritating the audience. 11-year-old Kousei Arima was a piano prodigy who dominated piano competitions across Japan and became very popular among fellow musicians. Trained by his own mother who had a very strict method of teaching, Kousei was able to play with such perfect accuracy that he was infamously dubbed as the “Human Metronome.” Shortly, his mother died, and the trauma resulted to Kousei developing a psychological condition wherein he couldn’t hear anymore the sound of his own piano. Hence, his stardom in the music world came to an abrupt halt. Two years later, Kousei still couldn’t bring himself to play the piano. 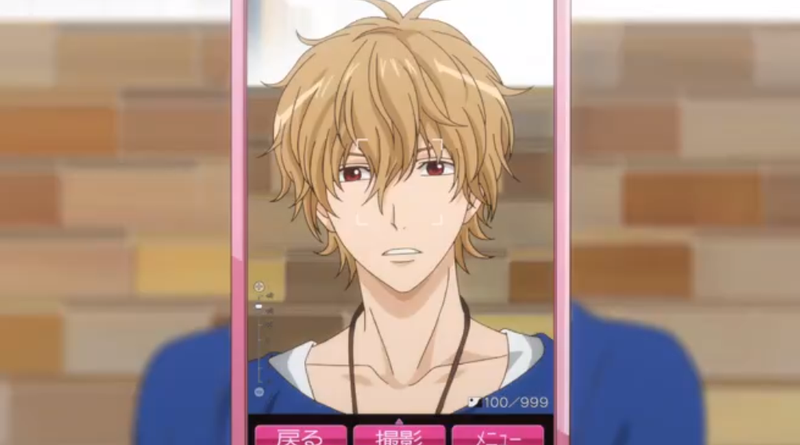 He was content in living his life with his two childhood friends Tsubaki (athletic and boyish, but secretly liked Kousei) and Watari (star of the soccer team; extremely popular with girls). Kousei was still depressed over his mother’s death and he viewed the world in monotone, without any touch of color. One day, a girl named Kaori Miyazono, Tsubaki’s classmate, asked her to be introduced to Watari. Tsubaki then invited Kousei to come with them, since Kaori was a violinist (so Kousei could talk to her about music if the conversation got dull). Reluctantly, Kousei obliged. Surprisingly, when Kousei met Kaori, his life started to take color. Her free-spirited style of playing the violin touched his heart, and he realised that music should be played freely and not so rigid like he was used to playing. Kaori joined violin competitions as well, but she did not care about winning; she simply wanted to be remembered by those who hear her music. Kaori then appointed Kousei to be her accompanist, and from there, he started to break free from his self-induced shell. 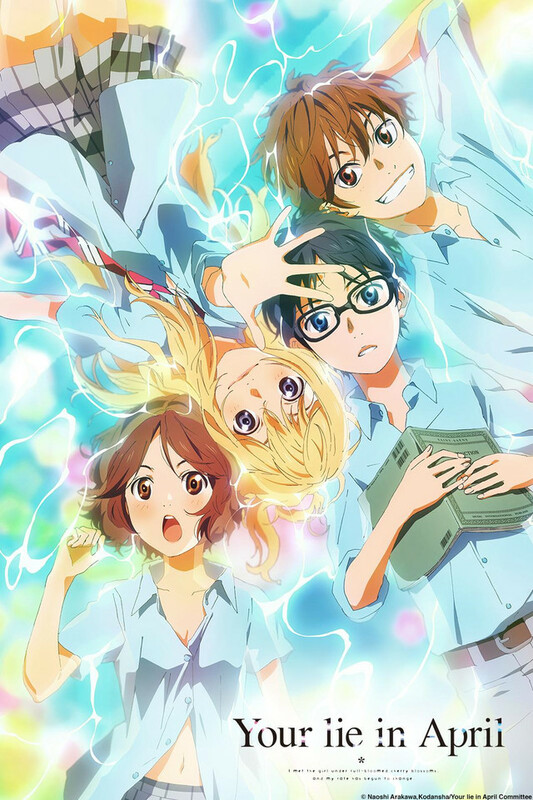 Stretching for 22 episodes, Your Lie in April is a very colorful and mellow anime. Each episode is immersed in a soft, colorful ambience, thanks to the pastel-colored style of animation and the consistent classical music in the background. First Impression: Well when I first heard of the title, I was intrigued. And when I watched the first episode, I immediately guessed what the deal is. (Hint: Kaori and Kousei’s meeting is not a coincidence. It was all planned by Kaori.) Cliche, but still very effective. Kousei and his mom’s love-hate relationship. In earlier episodes, it was repeatedly shown that Kousei’s mom often physically abused Kousei during their piano lessons. She was always striving for perfection, and she would beat him up for the most trivial mistakes; but Kousei didn’t mind. His mom was very sick, was in a wheelchair, and oxygen inhaler was always up in her nostrils. Young Kousei was always saying, “I will always get first place in competitions if it will make you better, mom.” However, in one unfortunate event, Kousei was beaten up by his mom in front of a crowd after a piano recital (for letting his emotions flow during the performance, and not strictly following the music sheet), and a bitter fight broke between them. Right after that, his mom died, and Kousei blamed himself for it. He kept thinking it was his punishment that he could no longer hear his piano. It was later revealed that the only reason his mom had been training him so harshly is because she felt like she was “running out of time.” Being terminally ill, she had nothing else to leave to Kousei but the gift of music. She was scared that in the future, Kousei might not be able to make a living as a musician, so the least she could do was teach him to be perfect at it. The reason behind the title. 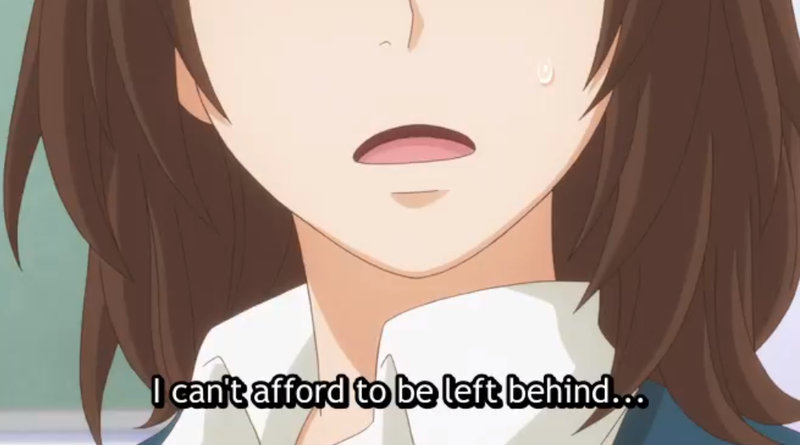 The moment Kaori was introduced in the series, I knew at once that she really wasn’t interested in Watari (hence, making it the “lie she made in April”). It was revealed in the end that Kaori was originally a pianist, and she was an audience in a recital where young Kousei first performed. After that, Kaori changed her mind and wanted to become a violinist, aiming to have Kousei as her accompanist someday. From there, she started to stalk him, only watching him from afar. Kaori’s illness. 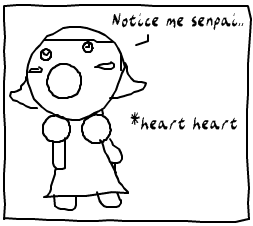 A lot of viewers are reminded of Clannad: After Story due to its tragic, melodramatic plot. For me however, this reminded me so much of YUI’s 2006 movie “Midnight Sun.” Musicians who had medical conditions rendering them paralyzed, and only wanted to be remembered by those who hear them–that movie was so dear to me that this anime strikes so much nostalgic feels. It is also a gentle reminder that we should live our lives to the fullest and pursue what we truly love (and stop trying to please others. ehem)–we’d never know how much more time we have. The only thing I didn’t like about it is the pacing–it can be very slow at some episodes, and the monologue can be quite boring. Aside from that though, everything is perfect. 16-year-old Erika Shinohara got separated from her best friend as soon as they started high school. She worried that she wouldn’t find new friends in her class, so as soon as she saw two cool-looking girls (who couldn’t stop talking about their respective boyfriends) she thought lying about having a boyfriend would make her fit in with them. Erika’s friends started to get suspicious that her boyfriend might’ve been nonexistent because she never showed them his pictures. Erika thought her problem would be solved if she could just take a picture of some random stranger. Determined, she stole a snapshot of a handsome guy she spotted across the street, and made a run for it. After a series of events, Erika found out that the guy is actually her schoolmate. 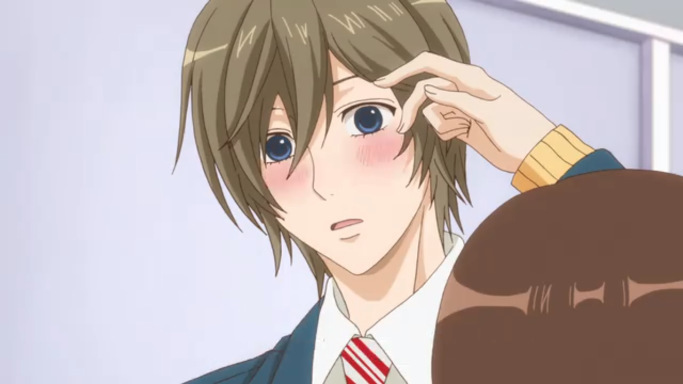 He is Kyoya, a notoriously popular guy in her year and went by the title “Prince”. She shared with him her situation, and he agreed to play along and keep her secret, but with a catch. Kyoya acted like a prince at school: gentlemanly and a total charmer. Every girl swooned over him and he was more than happy to entertain most of them. However, he showed his true colors whenever he was with Erika. Thus the title, black prince. A lot of people showed disgust in the relationship (especially Kyoya’s fangirls) as Erika was too ‘average’ for the perfect prince. She got bullied a number of times, and he came to the rescue each time. 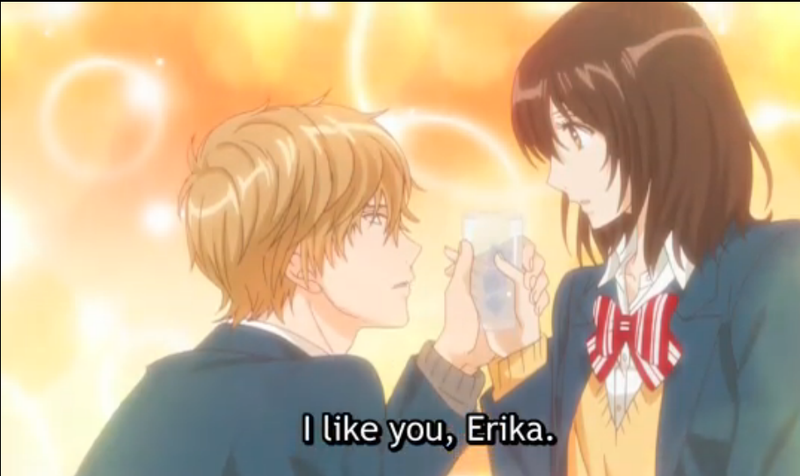 Kyoya was occassionally sweet to Erika despite their faux relationship. She realized she was slowly falling for him. Erika cried all the time because of unrequited love (with Kyoya only treating her like a dog, but still being awfully nice to her at times, making it impossible for her to move on). 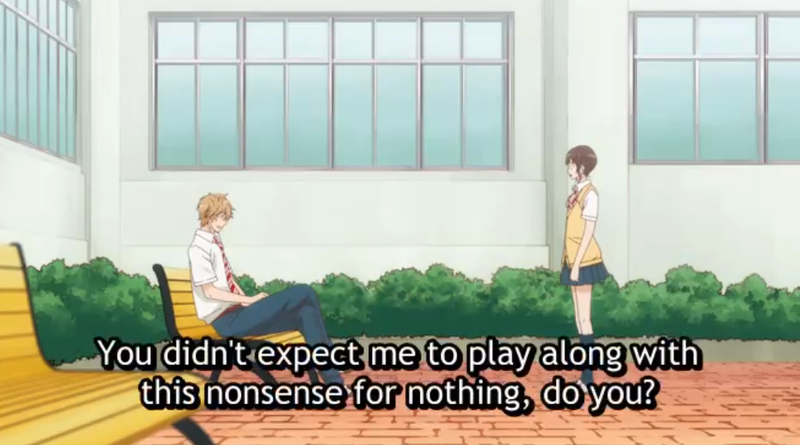 A third wheel appeared by the name of Kusakabe. 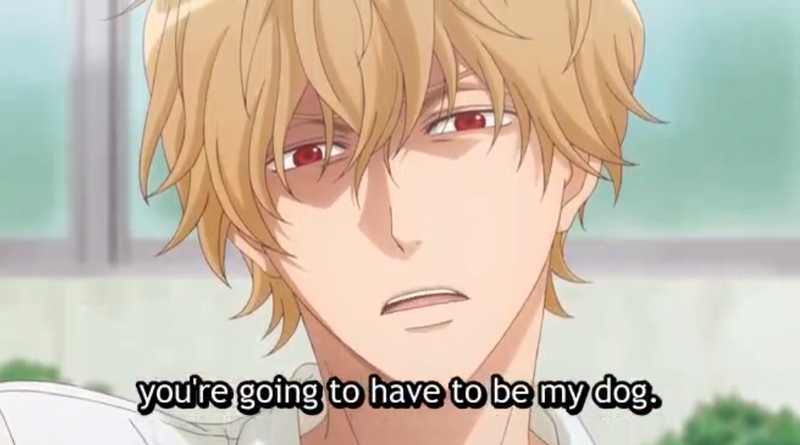 He instantly fell for Erika and got angry at Kyoya for not treating her the way she deserved. 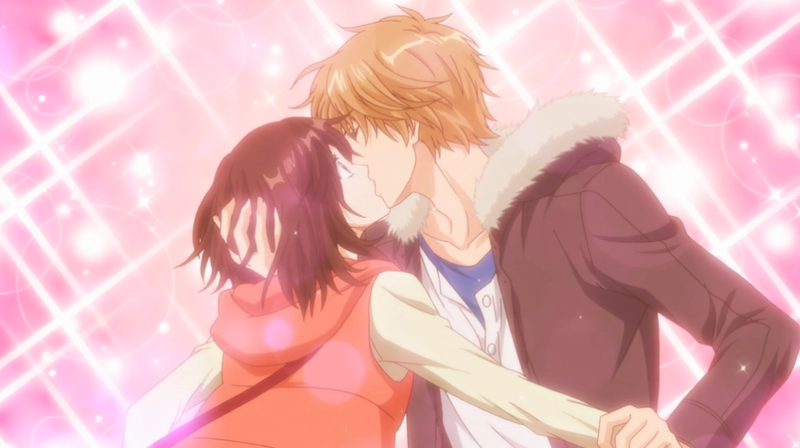 Finding out that her relationship with Kyoya was fake, he confessed to Erika and promised that he’d be a better boyfriend to her if she gave him the chance. 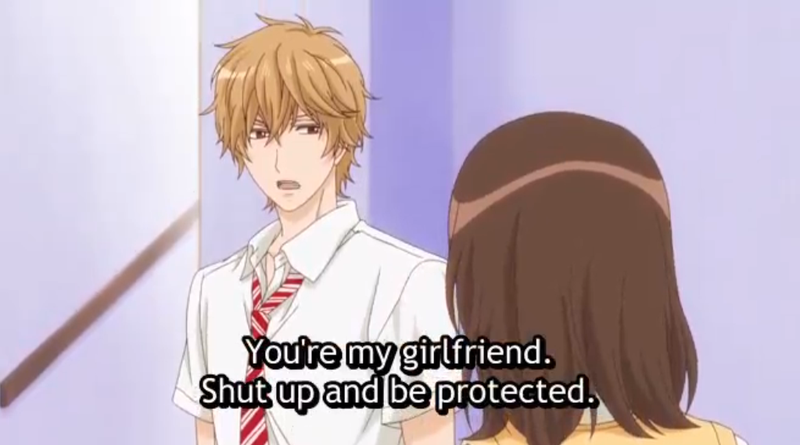 Kyoya realized his feelings for Erika after she tried to move on with Kusakabe. 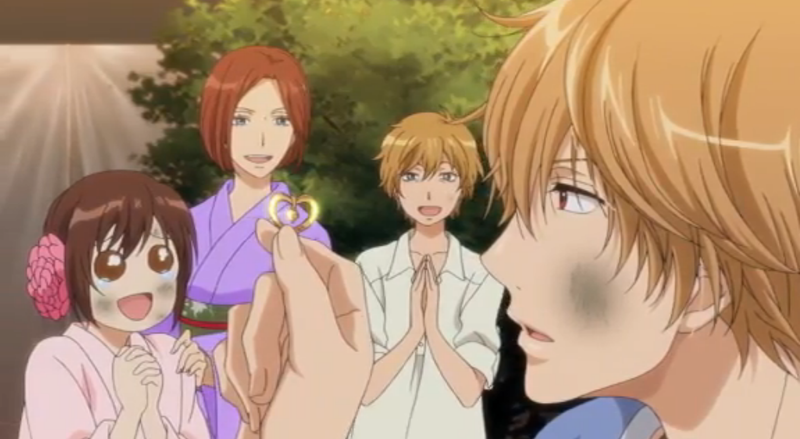 A few episodes later, Erika finally met Kyoya’s family, and they lived happily ever after. A good, satisfying ending. Other than Erika and Kyoya, there are only a few other characters. Reika – Kyoya’s sister who very much enjoyed bullying him. At first, she was not convinced that Kyoya had changed his ways and settled to having a serious relationship with Erika. Later, Erika proved her wrong. 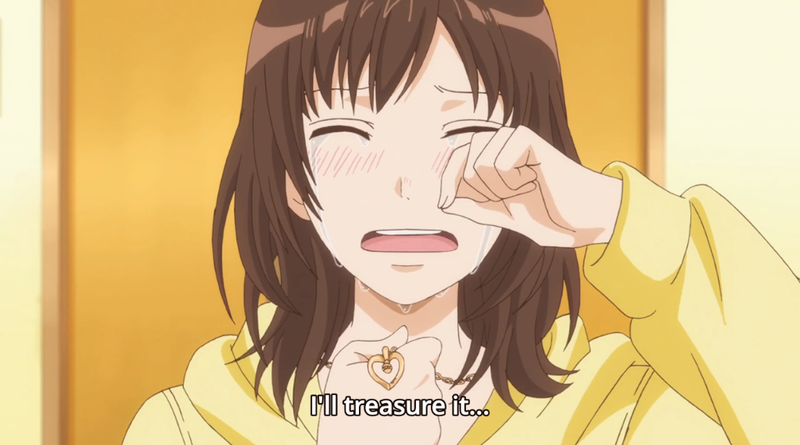 Kyoya’s mom – The latter part of the series focused on her broken relationship with Kyoya. Erika played a big part on mending it. Sanda – Erika’s best friend. Kusakabe – The clumsy and pessimistic introvert who caught Erika’s eye. He was the third wheel who got in between Erika and Kyoya. 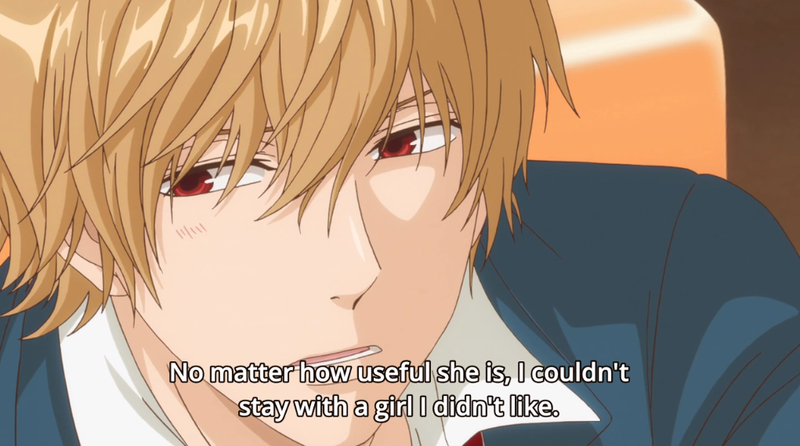 After dating him for a while, she realized that no one else can replace Kyoya in her heart. 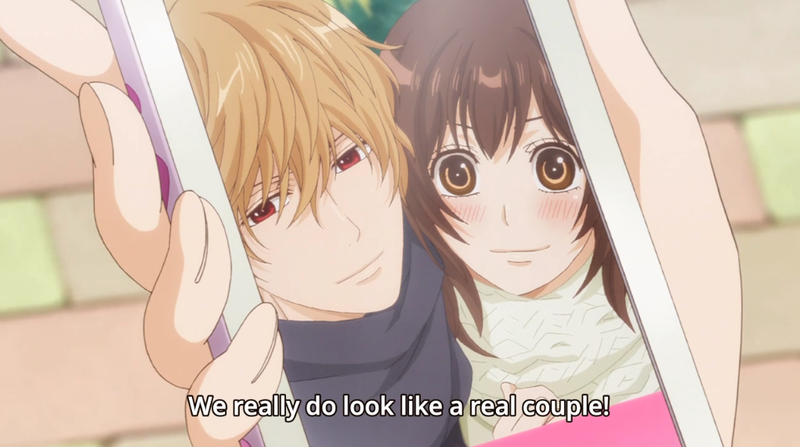 Marin and Aki – Erika’s classmates who were so obsessed about their boyfriends. Their characters became less prominent after their first year, as the group got in the same class as Sanda and Kyoya. For a while I had only been watching and reading titles with a heavy, mostly dystopian setting (Shingeki no Kyojin, Psycho Pass, Divergent series) and I thought to myself, “Why not go for a lighter theme this time?” I stumbled upon this series, and was not disappointed. 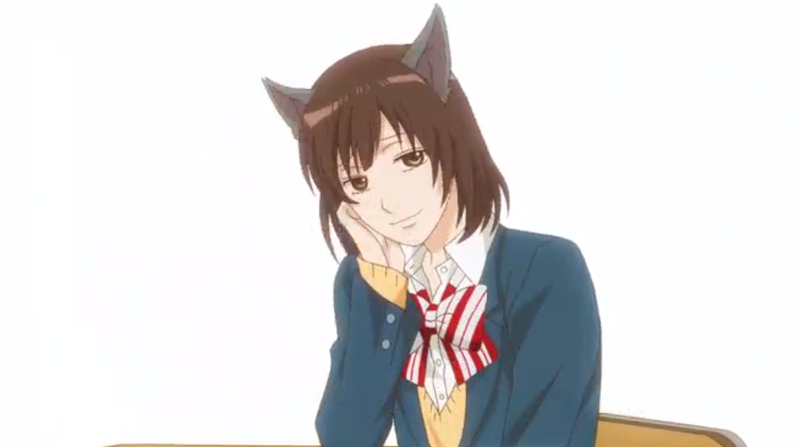 Stretching for only 12 episodes long, Wolf Girl and Black Prince is a delightful mix of comedy and romance. The original manga was written by Ayuko Hatta. 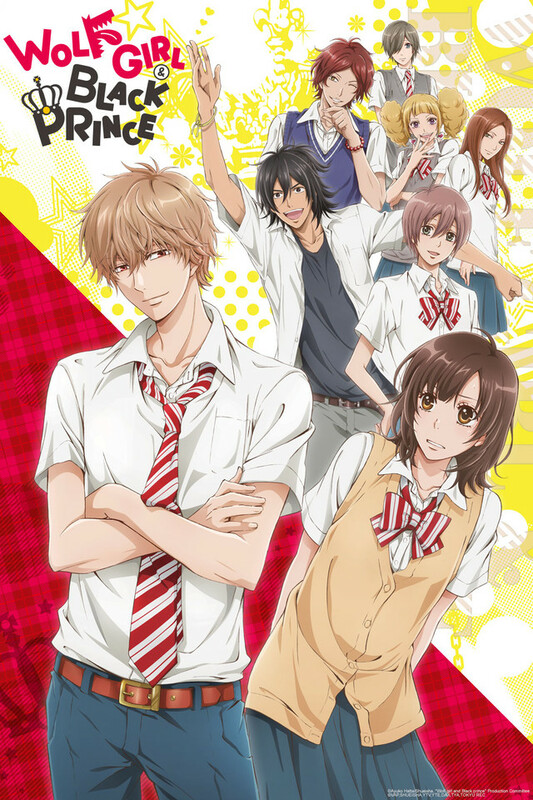 The series began airing on October 5, 2014, and ended on December 21 in the same year. Despite the annoying tendencies of the characters in the beginning, they slowly transformed by the end, and I must say that the character development (for Kyoya and Kamiya) is effective and emotional. I like how the flashbacks of Kyoya’s childhood memory of a destroyed snowman served as his motivation on staying unattached to people, knowing that they might leave him one day. The pacing of the series is pretty good and kept me glued to my seat as I watched one episode after another. While the character development for Kyoya is good, I felt like Erika’s was lacking. She started off as an annoying character who got into a lot of trouble for lying just to be able to fit in, and my feelings for her character only slightly changed as the series concluded. I wish she had a back story that would at least explain why she acts that way, why she’s so afraid of not making friends and failing to fit in. The series lost a bit of spark and slowed its pace after Erika and Kyoya finally got together (which is the climax of the series). There were still hilarious moments, but the only main conflicts remaining were: “Will Kyoya give in to Kamiya’s traps?” and “Will Kyoya reconcile with his mom?” which are interesting plot devices, but not quite at par with the earlier episodes in my opinion. Overall, I would recommend it. The 12 episodes is enough to distract you off the stress of real life and remind you of that bittersweet, unrequited love you had back in your teenage years. Give it a shot and it will surely give you a good time and leave a smile on your face. It’s that time of the year again, to say bye bye to your old self and to give birth to the endless possibilities of the coming year. A new chance to start on a clean slate. In accounting, we do this thing called forecasting. We get data from the previous year and make a reasonable prediction for the coming year. Then by the end of that year, we get the variances between the actual result and the forecast, and analyze what caused them. I think it would be nice to apply it in our personal lives. They’re technically like goals, but goals sound more grand and daunting. Forecasts just sound more comfortingly achievable, and it’s kind of empowering to look at them as predictions that can actually happen. These are my life-long dreams, and it’s incredibly overwhelming to think that I will start pursuing them all this year. But then again, when else will I start? For every goal, we need to take action. 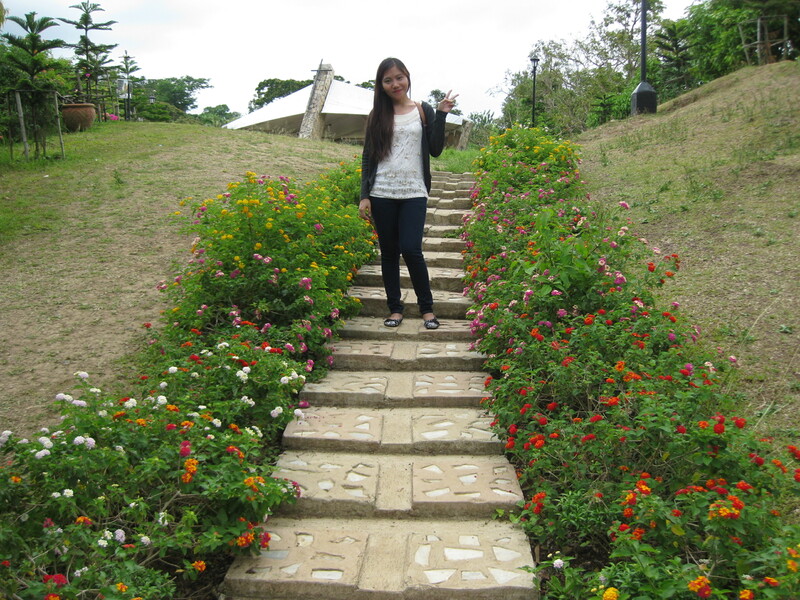 After all, how can we reach where we want to be, if we’re not even willing to take the first step?